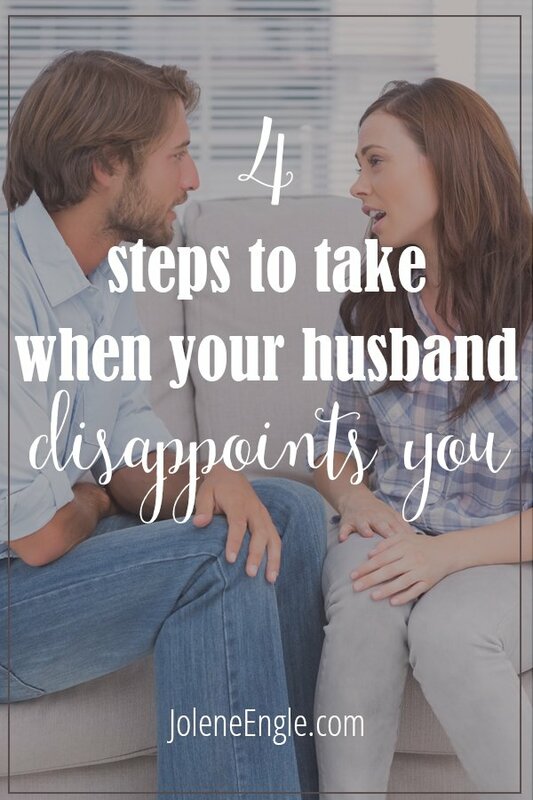 Your husband will disappoint you. It’s a given. Just like you will disappoint him because that’s what sinners do–we let others down. How you handle the disappointment will determine the tone of your relationship as well as how your husband will respond to you. 1.Tell him what you need. Share your heart (my term for communicating with your man) because our men can’t read our minds. I’m not sure why we expect our husbands to just ‘get us’ and understand all that we struggle with. They can’t. So be vulnerable and calmly tell your husband what you desire from him. Ask him if he can meet that need. (Just a note. Tell him just one thing you desire from him at a time. Giving him a laundry list of how he’s not measuring up to your ideal of a great husband can bring discouragement or apathy to his heart.) Then let him know how much you’d appreciate him making the effort to listen to you and to meet your desire. Do you need him to fix a situation or just listen to you? Do you need him to stop doing something or start doing something? Have these conversations so you can improve your marriage. Make sure you invite him to share his needs and desires from you as well. Don’t tell him your needs when you’re in a fight because your words probably won’t come out right. If I’m not exercising Spirit-filled self-control, my words will have the tendency to come out laced with pride with a side of snark. Kind and gracious words are nowhere to be found. 2. Perspective matters. Your man is not your Messiah, he’s your husband. He’s not designed to meet all of your needs so keep your expectations in check. Head out to Bible study so you can get grounded in the Word. Cultivate deep relationships with your girlfriends. Take up a hobby, learn a new skill, or spend time ministering to others. God designed you to use your brain and engage in community. Do both. Your husband shouldn’t be your world. 3. Focus on his strengths rather than his weaknesses. We all have them. Ask yourself if you want your man continually pointing out your weaknesses–I didn’t think so. Study where he shines and tell him thank you for it. Gratitude squashes disappointment and makes for a sweeter marriage. Practice gratitude as a wife. The above list is not easy because it goes against our flesh. However, what is your alternative? Be critical, martyr-like, resentful, condescending, cold, or bitter towards him? (By the way, if you want to feel cherished by your guy, these attitudes and actions won’t make that happen.) So do the other things instead. If you always default to being critical, condescending, cold, bitter, etc. as you justify your position, just know that your husband is probably disappointed by you. 🙁 Yes, it goes both ways. As a wife, use your God-given position of influence to build up your marriage, not tear it down.